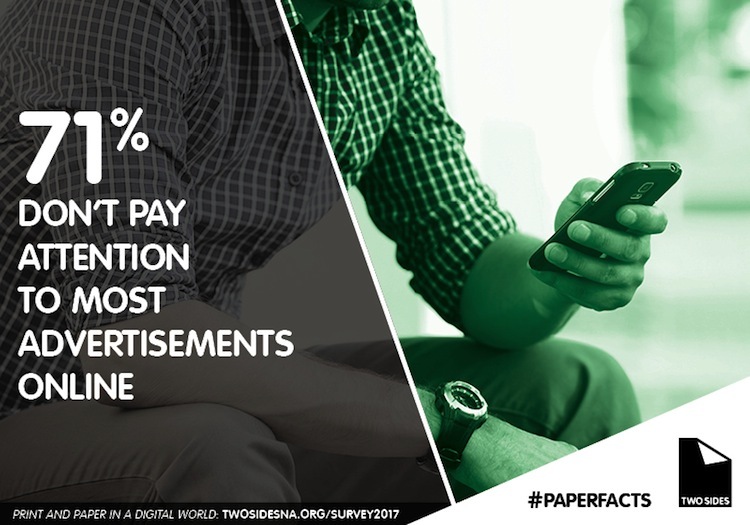 Results of the latest Two Sides consumer survey show that people prefer and respond more positively to print. It seems like every time we use social media or the Internet, ads pop up or invade our screen in some form, not to mention unsolicited emails. Some are targeted directly at our interests due to advances in data mining and companies using our browsing information to their advantage. But do we pay attention to them? In general, NO! According to the latest Toluna consumer survey commissioned by Two Sides, “Print and Paper in a Digital World,” Americans are not very responsive to online advertising. A majority of respondents (71%) indicated that they do not pay attention to most advertisements online and 69% find online ads annoying and usually not relevant. The youngest age group surveyed (18-24-year-olds) felt slightly less negative about online advertising with 65% saying they do not pay attention to online ads and 64% finding them annoying and not relevant. The majority of both age categories (66%) could not remember the last time they willingly clicked an online ad. When advertising turns up in our inboxes, do we read it? Less than half the time according to the survey; 49% of all consumers and 43% of the younger age group said they read marketing emails at least once per week. 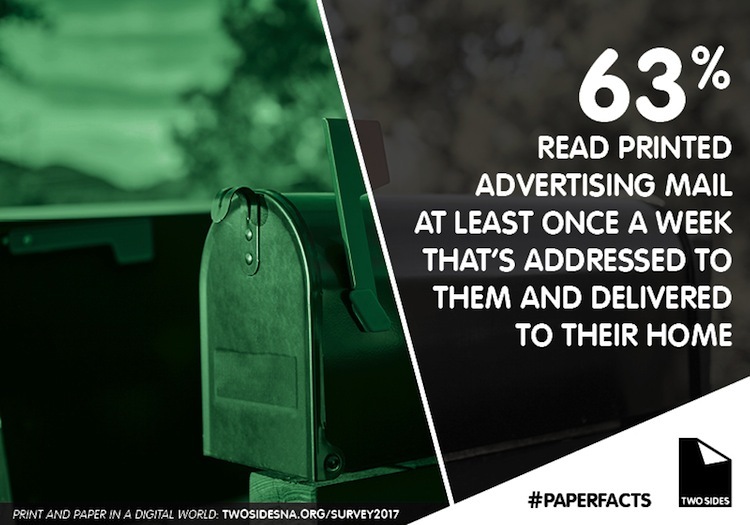 About half of those surveyed (54%) pay more attention to messages and ads on printed leaflets and mail than messages and ads delivered electronically. A similar number (55%) said they would be more likely to take an action after seeing an ad in a printed newspaper or magazine than if they saw the same ad online. What about printed ads that turn up in our mailboxes at home? Of all the consumers surveyed, 59% said they read leaflets, flyers and other unaddressed mail delivered to their home at least once per week. For the 18-24-year-olds, the number was 47%. Slightly more people (63% and 49%, respectively) read advertising mail (at least once a week) that’s addressed to them and delivered to their home. When it came to trusting ads, 59% of consumers said they did not trust online ads. These results are similar to those from a recent study in Germany, where more than half of those surveyed said they trust print ads while only 16% said they trusted ads on websites. A study of U.S. internet users in 2016 showed that more than 80% trusted print ads in newspapers and magazines when making buying choices. Only 39% trusted online banner ads and a similar proportion trusted mobile phone ads. While we continue to be bombarded by advertising online, it is clear that print ads are most effective and deliver results.